I am hopeful: I had a reasonable night's sleep. I probably slept 6-7 hours, out of 13 laying in the dark. I am afraid that I am keeping Paul up, or worse that I have given him my cold. I am definitely coughing more than anyone else left. If I can make it through today, then everything else will be downhill. The snow of earlier in the week is still on the ground here: it has not gotten above freezing since it fell. Where the sun hits it, the snow melts during the day, but then freezes again at night. In spots sheltered from direct sunlight, the snow sits on the ground. Purba is leading the way today, and sets a pretty quick pace. Paul and I are the weakest -- we are now both suffering the cold. 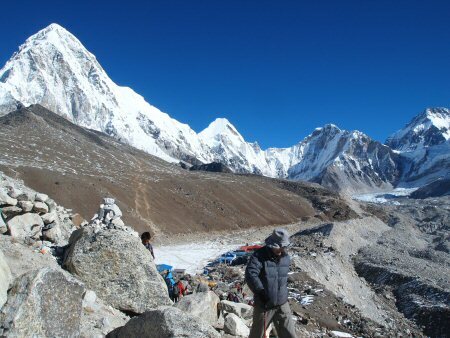 The trail goes gradually uphill, above the Khumbu glacier. I was expecting to see an icy river, but instead it is all covered in rock. Unless you know what to look for, it would just look like a weird valley. We cross over the glacier, and see only rocks. Across the glacier we can see an icefall: not the Khumbu Icafall that Everest climbers must negotiate, but just a little icefall coming in the side. As the trail rounds the corner to Gorak Shep, the way before us comes into view. 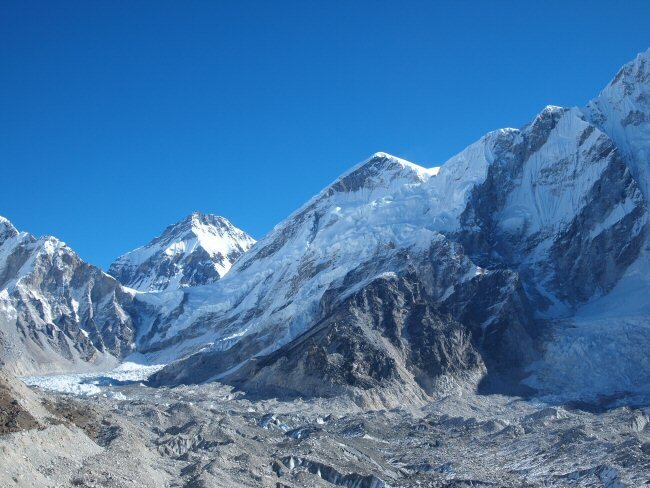 Gorak Shep is down steeply a hundred feet or so, then Kala Patthar rises 1000 feet behind. Normally 1000 feet is nothing -- I could run up that. But today it just looks impossible. 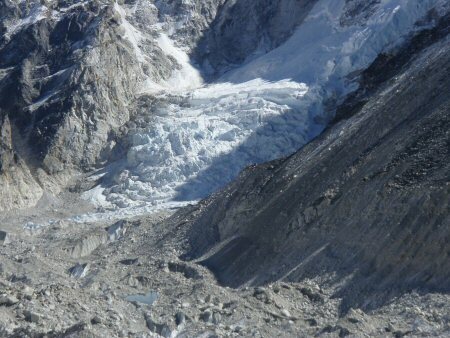 I am making up my mind that I will go go Gorak Shep and then wait for the others to climb Kala Patthar and return. Then Paul says he can go no further, and needs to turn back with one of our sherpas. Turn back now, or keep going to the top? I decide that I had best turn back as well. So Paul and I bid goodbye to the rest of the group and turn around. Suddenly everything becomes much more difficult. Going downhill is a challenge, and the short sections of uphill on the way back become almost insurmountable. The hike back to camp is the most challenging of the whole trip, for Paul and me both. I called home to say I was headed down, then went straight for bed. Four hours later the rest of the party got back. That 1000 feet climb had taken thhem a long time. I was sure I had made the right decision. It feels good to know we are going back down tomorrow. 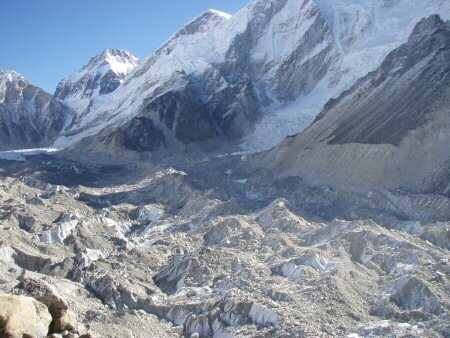 Heard that Wes and Ellen were evacuated by helicopter back to Kathmandu, and that they are now OK. They are staying at some picturesque villages off the main tourist track. That sounds pretty good, compared to where we are now.